This painting is a bit darker then this appears. It was late tonight when I took the picture (inside & under artificial warm lights). I didn’t finish my painting today till almost 11:00 pm, that’s because I took my friend out for a birthday dinner. By the time I got back, I had to pack up some paintings, get some chores done and take care of business. I’m glad to have made my midnight deadline! 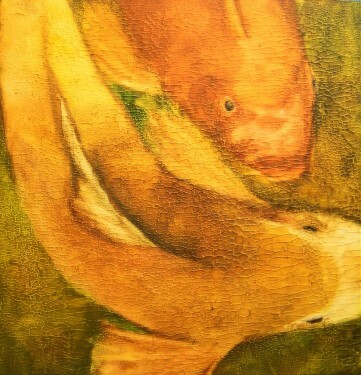 This entry was posted in art sales, Art Talk and tagged A painting a day, art, carp, Gesso, Koi, nature, water color by shanti marie. Bookmark the permalink. I find your “Golden Boy” to be a wonderful painting and the colors in this creation are rich and fluid bringing life into your art; will look forward to future paintings.